Seas are projected to rise between 3.7 and 6.1 feet in the area around Camp Lejeune by the end of this century. By 2100, the base's barrier islands—which provide storm surge protection for the mainland—and the low-lying areas along the New River could face daily flooding. Their inundation could affect storm surge exposure for the mainland portion of the camp. Camp Lejeune’s mission is to train and maintain combat-ready forces. The majority of the active duty forces at Camp Lejeune are Marines, but the Navy, Army, Air Force, and Coast Guard also have a presence at the installation. Camp Lejeune is located along the New River near Jacksonville, North Carolina. It includes several barrier islands, which provide a buffer between the Atlantic Ocean and the mainland. The camp, which includes amphibious assault training facilities and live fire ranges, is supported by six additional facilities, including Marine Corps Air Station New River. Camp Lejeune is an integral part of both the community and the economy of Onslow County. Including salaries, construction, services, and other expenditures, the annual economic contribution of the camp to the state and surrounding region is over $4 billion. 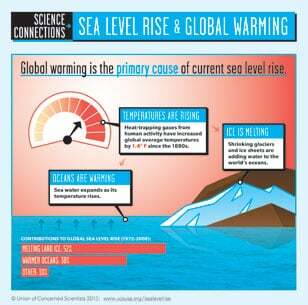 The camp's exposure to coastal flooding is projected for the years 2050, 2070, and 2100 based on the National Climate Assessment’s midrange or “intermediate-high” sea level rise scenario (referred to here as “intermediate”) and a “highest” scenario based on a more rapid rate of increase. The results below outline potential future flooding scenarios for Camp Lejeune, assuming no new measures are taken to prevent or reduce flooding. Certain areas face daily high tide flooding. Today, tidal flooding within Camp Lejeune affects low-lying locations, mainly wetlands, eight times per year on average. In the highest scenario, flood-prone areas within the camp are underwater nearly 90 percent of the time by 2100. Flooding during extreme high tides will become more extensive. In the highest scenario, higher water levels caused by extreme tides flood roadways roughly eight times per year by later in this century. 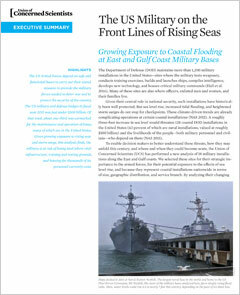 Loss of protective barrier islands is possible. By 2070, in the highest scenario, Camp Lejeune’s barrier islands could flood with most high tides and be underwater 35 percent of the time. Sea level rise exposes previously unaffected areas of Camp Lejeune to storm surge flooding. By 2100 in the intermediate scenario, the area in Camp Lejeune exposed to a Category 1 storm surge flooding increases by about 4,000 acres (or 3 percent of the camp); in the highest scenario, it increases by about 7,000 acres (or 5 percent of the camp). Sea level rise exposes Camp Lejeune to deeper, more severe flooding. In general, over time, the area inundated by 10 feet or more of seawater during storm surges will increase. In an end-of-century worst-case scenario involving a Category 4 storm, six feet of sea level rise in the highest scenario could more than double the area exposed to flooding 20 or more feet deep—from 7 to roughly 20 percent of the camp. In order to plan effectively for the long term, military decision makers with authority over Camp Lejeune need to understand how sea level rise may permanently alter the landscape of this coastal installation and where the threat of storm surge may become intolerable. To take action, however, individual installations like Camp Lejeune will need more detailed analysis and resources to implement solutions. Detailed maps for each scenario at Camp Lejeune are available via Dropbox.